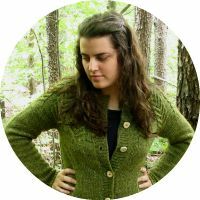 Wool and Wheel: In which I discuss literary heroines. 1. Introduce yourself! Divulge your life's vision, likes, dislikes, aspirations, or something completely random! I'm Kristin. I'm a twenty-two year old bookworm and classic movie enthusiast. I'm also a fan of Doctor Who and Sherlock (I know that will probably be important to some of you :), and tons of other BBC shows and mini-series. I love being creative: I sew, embroider, knit, spin, and dye yarn. You can read more about me here. 2. What, to you, forms the essence of a true heroine? A true heroine is godly, kind, clever, humble, loving, and honest. But goodness, she can't be too perfect or we won't be able to stand her! :) She has to have some flaws that I can relate to, but she should be able to recognize them and hopefully work past them. 3. Share (up to) four heroines of literature that you most admire and relate to. a) Jane Eyre. When I reread this book last year, I was struck by how much I felt like I knew Jane. She's such a wonderful character! (See question number 5 below.) Not only that, but I could relate to her in a lot of ways: I tend to keep my emotions to myself instead of speaking them or showing them outwardly, I'm a people pleaser, etc. c) Anne Elliot. I'm quite stubborn about my opinion when it comes to important matters. But in trivial matters, I sometimes find myself being swayed by a seemingly good argument. Then I'll suddenly realize how ridiculous it is and think to myself: don't be like Anne Elliot! 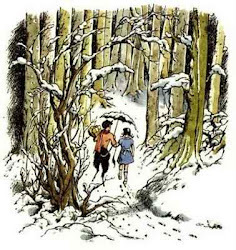 :) Honestly, though, Anne is a lovely character. She allowed people to mislead her in the past, but she ends up being stronger and more confident in her own decisions. Also, even though her dad and sisters are completely awful, she still treats them in a loving, respectful way and she's very patient and long-suffering. 4. Five of your favorite historical novels? 5. Out of those five books who is your favorite major character and why? Last year I said Elizabeth Bennet. This year I'll go with Jane Eyre. With the way the book is written, you really get inside Jane's head and understand her. I love the passionate nature that's hiding beneath her quiet and calm façade, how she really just wants to be loved, the fact that she's rather plain instead of gorgeous, how smart she is, and how she's strong enough to do the right thing. She was able to move past a horrific childhood and become a wonderful person. Basically, Jane is awesome. 6. Out of those five books who is your favorite secondary character and why? 7. If you were to plan out your dream vacation, where would you travel to - and what would you plan to do there? My dream vacation, if money and time were no object, would be a tour of Europe. Most of the time would be spent in England, but I'd stop in France, Scotland, and Ireland, too. Most of my favorite books and favorite authors are English. So I would visit all of the places associated with them. The country estates where my favorite Austen adaptations were filmed, Jane Austen's house, the pub where C.S. Lewis and the Inklings met, Platform 9 3/4, Beatrix Potter's home, etc. I would shop for books in London and find the TARDIS and 221B Baker Street. I would wander through the Yorkshire moors, see the Loch Ness monster, read in an English garden, tour ancient castles, and probably cry when I saw the Eiffel Tower. 8. What is your favorite time period and culture to read about? I love to read about just about any time period and culture! I am a bit obsessed with murder mysteries set in 1930s England. :) In general, I love reading stories that take place in the years between 1920 and 1960. As far as classics or historical fiction go, I like to read Regency era and ones set in late 1800s-early 1900s America. 9. You have been invited to perform at the local charity concert. Singing, comedy, recitation - what is your act comprised of? 10. 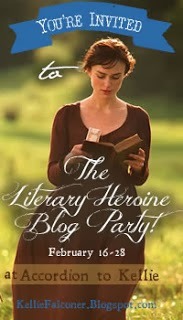 If you were to attend a party where each guest was to portray a heroine of literature, who would you select to represent? 11. What are your sentiments on the subject of chocolate? It is my one weakness. *ahem* (Name that period drama!) I love it too much. Absolute favorites are Jane Austen and C.S. Lewis. Roald Dahl, Shannon Hale, Gail Carson Levine, Julie Klassen, Kate Dicamillo, and Deeanne Gist are some other authors whose books I have read most of (or all of) and enjoyed. 13. Besides essentials, what would you take on a visiting voyage to a foreign land? 14. 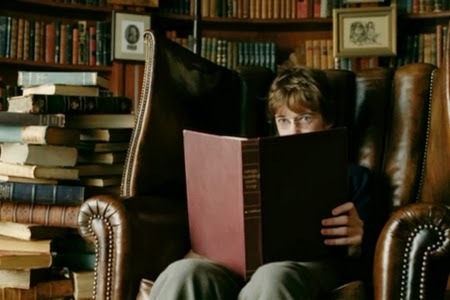 In which century were most of the books you read written? Probably the twentieth century. Followed by the 21st century, and then the 19th century. I don't think I've read any books written before then (except the Bible). 16. 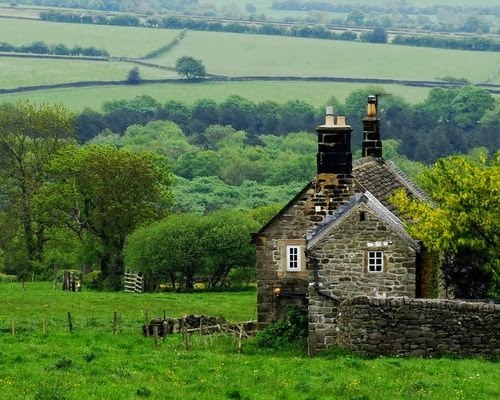 Describe your ideal dwelling place. A typical old southern farmhouse. The house is two stories, with a wrap-around porch and a tin roof. There's a little orchard off to one side (I just love that most old farmhouses had an orchard), and a tire swing hanging from a tree in the front yard. Plenty of huge, ancient trees on the property. Inside, all of the walls are painted lovely colors, and they display a hodgepodge of embroidery, photos, and quirky artwork and prints. There would be a yellow and green kitchen with one of those gorgeous 50s dinette sets. All of the furniture is sort of old and mismatched, and there's a record player in the living room. And there's a library that is every bookworm's dream: wall to wall built-in bookcases, complete with a rolling ladder. 17. Sum up your fashion style in a short sentence. 18. Have you ever wanted to change a character’s name? Maybe Klaus, the brother in The Series of Unfortunate Events. I like the sisters' names (Violet and Sunny) and their last name. But Klaus...it reminds me of Santa. 20. Three favorite nonfiction books? 21. Your duties met for the day, how would you choose to spend a carefree summer afternoon? Reading, watching a favorite movie, knitting, and enjoying some ice cream. 22. Create a verbal sketch of your dream hat - in such a way as will best portray your true character. 23. Share the most significant event(s) that have marked your life in the past year. I became an aunt! My sweet little niece Stella was born back in October. :) And much more insignificant, but still exciting, was the fact that I got a spinning wheel last May. 24. 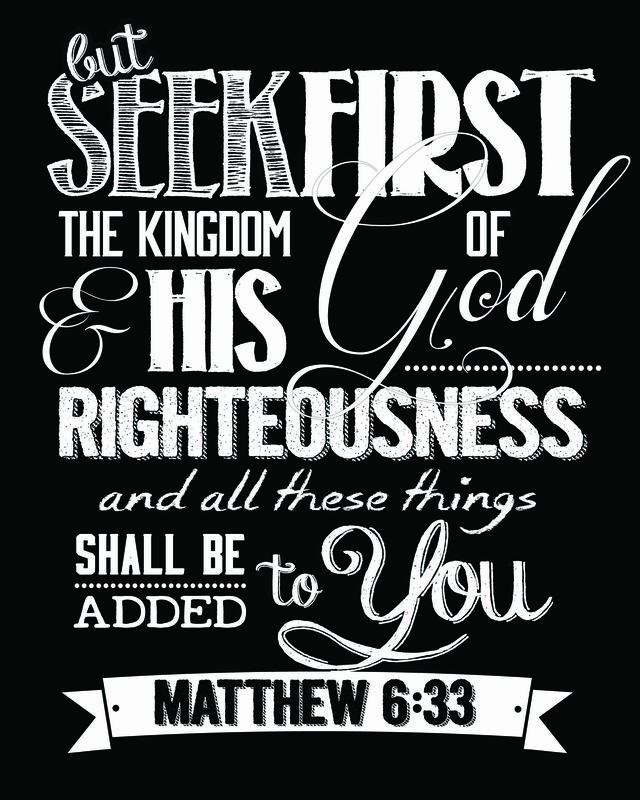 Share the Bible passage(s) that have been most inspiring to you recently. I wouldn't say Mr. Collins is a favorite (I have problem picking just one and there are sooo many secondary characters out there), but I am finding him more funny and less embarrassing (yes, I am embarrassed during movies, and even books for/by fictional people). I had trouble with the villain question too. I also feel embarrassed for fictional characters sometimes. :) But not so with Mr. Collins! I don't think he would be capable of feeling embarrassed himself, so I don't feel it for him either. Love Lark Rise! My mom and I forever quoting our 'one weakness's! It is such a lovely series! :) I've really been wanting to watch it again lately. I love all of the characters. That was so much fun to read. Great answers! I agree about how it's frustrating if heroines are *too* good. 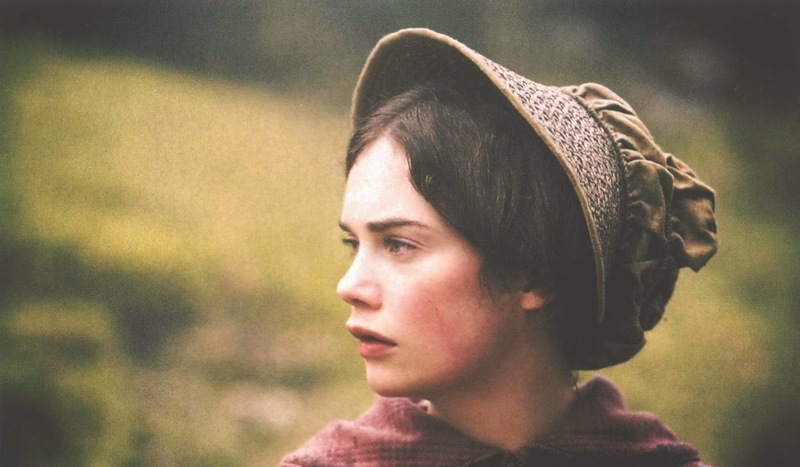 Jane Eyre is one of my favorite characters as well! Thank you for the comment on my blog! I loved hearing what you had to say about Mansfield Park. It isn't my top favorite Austen either, but I enjoyed it so much more than I expected to. The only Jane Austen I have yet to read is Northanger Abbey. Have you read that one? Thanks! Yes, I've read Northanger Abbey. I really enjoyed it: Catherine Morland is a likable heroine, and Henry Tilney is a dream. :) And I love that Austen was spoofing the "Gothic horror" novels of her time, while still sort of writing one. It feels different from all of Austen's other novels, because there's a bit of a mystery involved. Mr. Collins! Hee hee! He IS horrible and unctuous. It sounds like we would bump into each other a lot on our dream vacations! He is, isn't he? :) Yes, it sounds like we would! Liking Doctor Who and Sherlock makes us kindred spirits. I'm assuming you've seen the BBC Jane Eyre adaptaion judging from your picture selections of Jane. :) It's my favorite miniseries from BBC. Ruth Wilson is a superb Jane Eyre. I love it when they're under the tree, talking about her future and his "engagement" to Miss Ingram and the way she cries. She is not a pretty crier and she knows that and still goes for it! I believe that scene more than any other from that miniseries. Yes, I absolutely love that mini-series! It's by far my favorite Jane Eyre adaptation. Ruth Wilson does do an amazing job, as does everyone else. I never get tired of watching that one! I nominated you for The Sunflower Blogger Award, but please don't feel pressured to participate if you don't really want to do so. I love that Mr. Collins is your favorite secondary character! He certainly brings out strong emotions!! Love your description of Jane Eyre. I hope I can be as calm and strong as she when listening to other's stories and facing trouble. Mr. Collins is so funny. :) And Jane is such a lovely character!